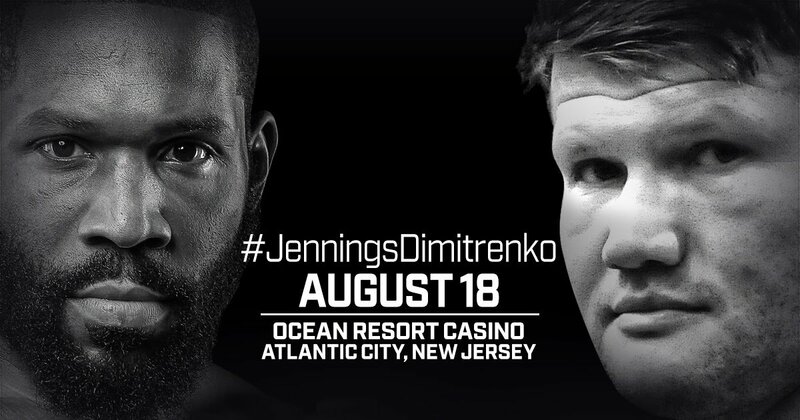 Heavyweight contender Bryant “B.Y.” Jennings was born and bred in Philadelphia, but on Saturday, August 18, he aims to bring some of that Philly firepower to the Atlantic City Boardwalk. In the co-main event, Philadelphia native Jesse “Hollywood” Hart (24-1, 20 KOs) will defend the NABF super middleweight title in a 10-rounder against the battle-tested Mike Gavronski (24-2-1, 15 KOs). Jennings-Dimitrenko and Hart-Gavronski will be televised LIVE on ESPN and ESPN Deportes at 10 p.m. ET, and all undercard bouts will be streamed on ESPN+ beginning at 7 p.m. ET. Hart’s nickname may be “Hollywood”, but he is a Philadelphia fighter to the core. His father is Eugene “Cyclone” Hart, a former middleweight contender who thrilled Philadelphia fight fans in the 1970s with pitched battles against the likes of Bennie Briscoe and Bobby Watts. Hart has won two consecutive bouts since dropping a unanimous decision to Gilberto “Zurdo” Ramirez for the WBO super middleweight title last September. In his last bout, April 28 in Philadelphia, he knocked out Demond Nicholson in the seventh round to keep his hopes of a Ramirez rematch alive. Hart’s world title quest will go through Gavronski, a native of Tacoma, Washington, who is riding a five-bout unbeaten streak dating back to November 2015. On the undercard (ESPN+), 2016 U.S. Olympic silver medalist Shakur Stevenson (7-0, 4 KOs) will face Carlos Ruiz (16-4-2, 6 KOs) in an eight-round featherweight bout. Stevenson last fought June 9 in Las Vegas on the Terence Crawford-Jeff Horn undercard, knocking out Aelio Mesquita in the second round. Former WBA super featherweight champion Jason Sosa (20-3-4, 15 KOs) of Camden, New Jersey, will take on Reynaldo Blanco (14-4, 8 KOs). Sosa, who has dropped two in a row, is seeking to get back into contention in the 130-pound division. Philadelphia fan favorite Christian Carto (15-0, 11 KOs) will square off against Tijuana, Mexico, brawler Javier Gallo (25-15-1, 13 KOs) in an eight-round bantamweight fight. Atlantic City’s Thomas LaManna (25-2-1, 9 KOs) looks to extend his five-bout unbeaten streak against Matthew Strode (25-6, 9 KOs) in an eight-round super welterweight bout. Joseph Adorno (7-0, 7 KOs), who is also scheduled to fight July 7 in Fresno, California, will see action in a six-rounder. And, in a heavyweight special attraction, Oleksandr Teslenko (13-0, 11 KOs) will fight an opponent to be determined.